Ellen Martin has a soaring corporate legal career in Chicago's powerhouse firm Cowley & Tate. She is handpicked, under questionable circumstances, to perform a pro bono case in the sweltering Colombian town of Barrancabermeja. But Barranca is a place where she is not welcome and events soon conspire against her, pushing her into a downward spiral of trouble and desperation. She is kidnapped; arrested; shot at; and chased by the police, the military, a corrupt government, revolutionary groups, librarians, and common criminals while civilization seems to crumble around her. Revolution has come to the small city, threatening the stability of the whole country. Ellen's only help is Alex Heart, the musician housemate of the gay architect nephew of her personal trainer. Alex turns into her knight in shining armor, and romance blooms and fades ... and blooms while she tries to find out who is behind her predicament. Nothing is as it seems. It's a bit chick-lit-y, a bit romance-y, a bit action-y, and lots of fun! Chasing Heart is a modern day fairy tale. If you are looking for a fast paced, suspense filled, humorous adventure with a touch of romance, you have found the book for you. Ellen, a lawyer is sent to South America by her boss to do a pro bono case. There the adventure begins. As she finds herself in situations, she finds Alex there to save her....on more than one occasion. I listened to this book while on vacation. It was perfect for my quiet time, the narration kept me interested. Ellen Martin is a corporate Lawyer who pretty much bungles her way through her job assignment in Barrancabermeja. This book is witty, and while I wouldn't classify it as a comedy, it's a humorous book and the narrator does a great job of capturing the sort of snarkiness of Ellen. Well, maybe snarky isn't the right word. Sarcasm? Cheeky? A lot of Self-deprecation maybe? Beneath it all, there's a big mystery to be solved, and while Ellen certainly trips her way into the middle of her share of danger, she's by no means stupid. There's a little bit of romance, but the main focus of the book is the danger that seems to be arrowing directly toward Ellen! There's also a lot of characters and in the beginning you learn several different stories that all end up colliding together at some point, so to me, that's always an entertaining way to get my story! Really was an enjoyable listen. I received this audiobook free of charge from audiobookblast in exchange for an unbiased review. 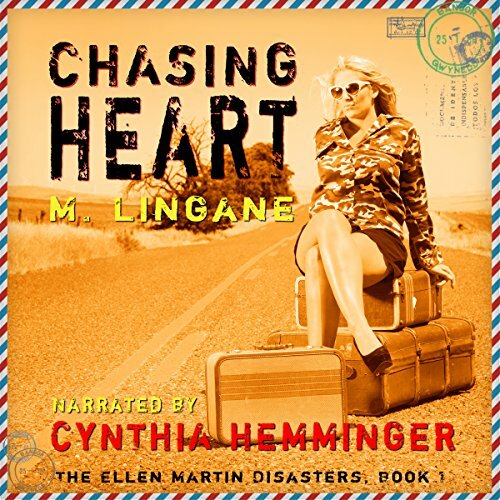 Chasing Heart: Ellen Martin Disasters is my first Mark Lingane. I don't mind saying this is a funny book! The only thing that is a bit weird is how it is edit, because i am not sure i like it. 9 hrs and 11 mins feels strangely a bit long, and i think that is in the editing. So i did lough out loud, and i find it funny how i laugh at the strangest things in the book! It kept me laughing all true the book, and the plot was nicely paced with action and a touch of romance. Mark Lingane first book on audible, i cant wait to see what this funny man does next! First book with Cynthia Hemminger too, she is good, but not grait. Her voice work misses a bit of "storytelling" in it, she is not 100% there in the story. She reads it as a story and not a book, and that can be a bit irritating at points! She is still getting a 4 out of 5 from me, so it is not like i hate her, she is just not 5 star material!